The more I learn the more I see the need for Tips for Improving Dog Behavior Separation Anxiety in Dogs. Dogs are suffering along with dog parents. There is property damage as well as damage to the dogs themselves. Help is here! Never use punishment as a treatment for separation anxiety in dogs. It will probably serve to make the anxiety worse so punishment is not allowed. You can see that the possibilities for anxiety in dogs is endless. We will focus on separation anxiety in dogs since it seems to me to be the most hazardous dog behavior for dogs and dog owners alike. I’m not going to guarantee that these tips will effect a cure for separation anxiety in dogs but they are things that you can do to manage the problem until a solution can be found. Never Punish an Anxiety Dog: Chances are very good that you will make the anxiety worse. Many dog owners turn to medical alternatives (anti-anxiety medication) only after all other separation anxiety management options are explored. This is always the dog owner’s choice. You do what you think is correct for your dog. I am not a vet nor am I offering a “cure” here. What I’m offering is a way to manage your dog’s separation anxiety or other type of dog anxiety until you can provide your dog with a definitive answer such as a qualified dog trainer or dog whisperer. I will cover these in brief since more information is available at the web location of the individual items. property in your absence. A way to protect your dog from himself. It’s about safety first for your dog and your property. It’s also about peace of mind, your peace of mind. It’s the only way to maintain control in your own home while protecting your dog. Thundershirts: A canine velcro wrap proven to help many types of anxiety in dogs, including separation anxiety in dogs by using gentle pressure. My customers report these wraps work better on smaller dogs than larger stronger dogs. Dog Appeasing Pheromone: Mimics the natural comforting pheromone produced by dogs. It reduces or completely stops stress-related dog behavior including barking, urination & defecation, whimpering and whining, anxiety, chewing or other stress-related dog behavior such as separation anxiety in dogs. Pheremone Calming Dog Collar For Anxiety in Dogs: Mimics the pheromone that the mother dog produces to calm and assure her puppies. The collar goes where your dog goes! items may, I say may, lessen dog behavior issues however, severe canine separation anxiety usually needs professional assistance. For your Big Strong Dogs! dog crate saved his dog’s relationship with the family. 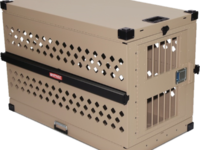 Without the heavy duty dog crate to manage the separation anxiety in dogs, his dog would have probably gone back to the Humane Society depriving both dog and dog parent of a great relationship. He could have been put down once a certain level of negative dog behavior (anxiety) was observed. I hope these Tips for Improving Dog Behavior Separation Anxiety in Dogs and Dog Anxiety has put you on a path to a solution to your dog’s specific anxiety-dog behavior problems. Once you have reviewed each product in specific detail I think you will agree that one or more of these items is a great first step to solving your dog anxiety problems. I find the thunder buddy shirts really do work well, they provide stimulation and help ease anxiety. A significant percentage of my clients claim so! In response to your comment, I have heard that getting another dog can help with separation anxiety. One thing you want to avoid is getting your dog fixated on that moment you get home. If you yell and jump for joy and create a highly desirable moment you come home, you’re setting your dog up for separation anxiety and fixation! Give them a job and pair it with your ‘leaving routine’! I’m no expert but from what I’ve heard and what I’ve read, getting a 2nd animal doesn’t help Separation Anxiety. Me personally, I would try it even though they say it doesn’t help. Just depends on your home and how your life is arranged. Good Luck to you. My dog gets bad separation anxiety. He just lays at the door for hours til I return, won’t eat, drink anything. Thinking getting a cat would be the best option so he won’t be so lonely. I would like to know the prices of the 42 inch heavy duty dog crates and for shipping to Edison NJ. I couldn’t agree more with this post. Separation anxiety in dogs is one of the most hazardous behavior problems that needs professional guidance. Make sure you hire a certified dog trainer because an untrained trainer could aggravate your dog’s behavioral issues. I am looking for metal replacement trays for two crates. One crate measures 22 x35 and the other approx 16 x 22. I’ve been googling but only found one so far.